Do you know someone who is in the hospital or at home recovering from a back surgery? Having a major surgery is painful, and the process of healing can take a bit of time. During these times, people can get a little depressed about their situation and down on themselves. Fortunately, you have the opportunity to brighten someone’s day with candy baskets. The best gift you can give someone who has gone through back surgery is the gift of your time. A phone call or visit can really brighten up a person's day and show them that you care for them. It can really help a person to know that others are thinking about them and rooting for a speedy recovery. Offer the person some help and make sure that they are comfortable. Its little things like this that really shows that you care. Giving someone a gift, small or large, is a great way to show that you appreciate and care for them. The economy is slow, and budgets are tight, therefore candy baskets for back surgery can make a perfect gift. A gift basket is the perfect balance between cost and value. Everyone loves candy which is why it is the perfect gift. Have you ever gotten a present that you didn't really like? How did you feel when you received it? When people get back surgery gifts they do not like, they act happy on the outside but feel let down on the inside. When you bring someone candy gifts, there is no doubt that they will love them. Candy baskets are perfect for cheering someone up after having a back surgery. One of the great things about these candy gifts is that there is a little something in them that everyone will love. Having one of these baskets around reminds people that someone cares every time they see it. Back surgeries can be tricky and one is never the same as the other. Recovery times can vary from person to person, but generally the surgeries take about 6-8 weeks to recover from. These weeks can seem like years when you are bed bound and not able to do things that you would regularly be able to do. Your best bet when putting together a candy basket is to buy one that is pre-made. A pre-made basket comes with everything already in it, and will save you a lot of money when compared to buying all the items individually. Just imagine having to go to the store and buying 40 bags of candy so you can put a couple of pieces in your basket. Buying the pieces individually would end up costing you a fortune. It makes sense to get a candy basket from a company that puts them together for you at a reasonable price. 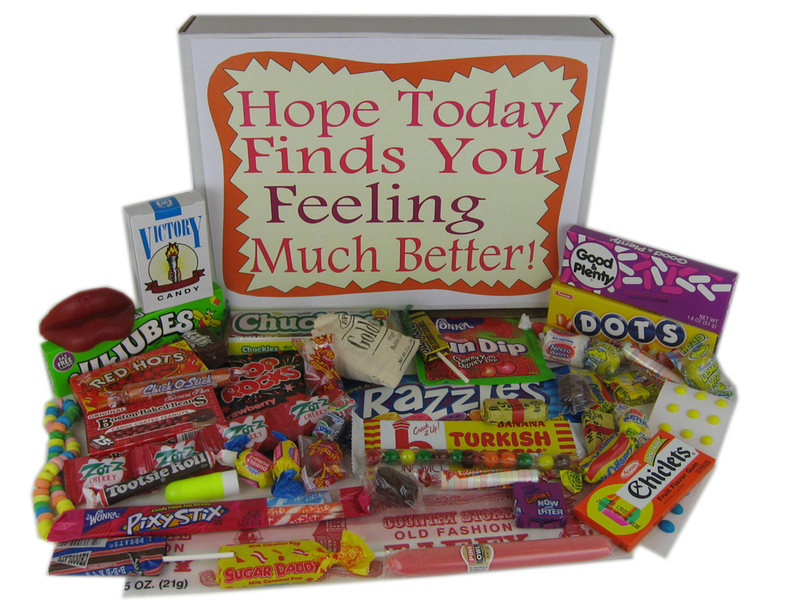 Get well candy baskets make perfect back surgery gifts to brighten someone’s day when they are recovering and recuperating. These sweet treats will assure them that they are loved and that better days are soon to come. 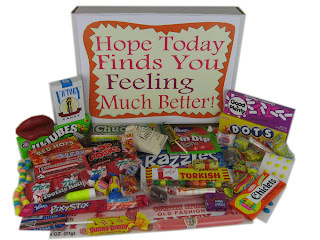 A candy gift basket is the perfect way to send your love and well wishes.